Many recipes that were tried by our great grandmothers,grandmothers and parents are now replaced with ready made frozen tubs,frozen packets and ready to eat meals.But do you think they have the same taste and flavors as the home cooked recipes from scratch.However,now in the busy world when you are a working mom and things are out of control,you may feel the necessity of the frozen packs to ease work.But you should definitely avoid these foods unless its very much required.I personally feel these packets/tubs of food stuff not only deteriorates health conditions and may not taste the same as the original recipe too.But a few recipes that can be made at home with less efforts and hardly takes any time is yogurt making at home.This can be done on a weekend and the rest of the week goes happily with the tub.Do you prepare your own yogurt batch at home?? If not,you must try this at home.Believe me,this tastes so delicious than store brought.Enjoy !! Boil milk in a pan on low medium flame so that the milk doesn't get burnt at the bottom of the pan.When it starts to boil,simmer the heat to low and boil for another 2-3 mins and turn off heat. When the milk reaches leuk warm (not cold) ,pour this in the bowl or containers. Add half a tsp of yogurt culture.Mix well with a spoon and cover with lid or cling wrap. Leave undisturbed for 8-10 hours to set. (summers may take lesser time) I usually leave overnight on the kitchen counter. In the morning,you may find thick creamy yogurt is ready. Serve or refrigerate until you use. * I usually make 1 liter batch each week.But for pics I made a small batch. * The milk should be just warm,not very warm not very cold. * In winters,place the bowls in oven to set with lights on overnight. * I usually use full fat milk for making yogurt but you can always use 2% reduced too.It becomes a slightly watery in texture. * A good yogurt culture yields a good yogurt.So,use culture accordingly.I usually use the curd culture bought from Indian stores.That works good for me. * Always reserve a tsp of culture before you end the previous batch to make new one. * If you wish to make really thick yogurt,boil the milk couple of more minutes to reduce the volume of water in milk and then proceed to make yogurt the same way. * If you like the yogurt to be sour(tangy) then leave for a couple of more hours on the counter.Or in winters you may use oven. For all basic homemade recipes,click here. I too feel the same .Unless required i don't buy anything from shops . Simple and delicious! Homemade is the best! I do make yogurt at home. I make a big batch on the weekend and kids love to enjoy the yogurt with a drizzle of honey. I make the yogurt with 2% milk, but once its set for over night, I drain the whey away from the container. 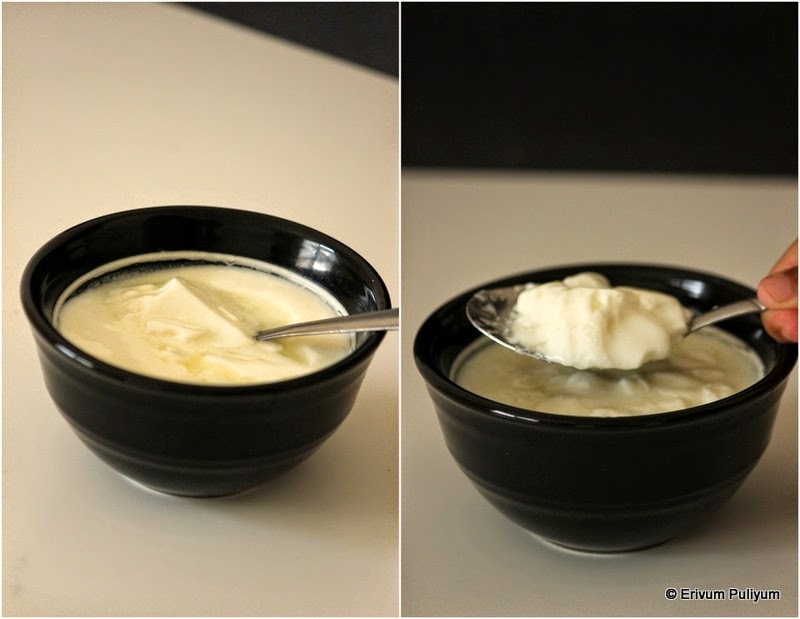 This makes it creamy and thick yogurt. I make Yogurt the same way and in a big batch. So much better than store bought ones. Yours is perfect. Always homemade's are the best....nice post Julie! I make it regularly. Nothing beat the freshness and taste of homemade. Nice shots Julie! wonderful clicks.. the yogurt looks perfectly set.. Always prefer homemade, much more yummy..
Love homemade curd.I use to make it for a long time but now I lost the culture. I started with Sprouts Greek yogurt.I tried many here but its getting too slimy. Homemade is the best always.. Useful post.